Designed to engage your child's heart and mind, these thirty-four customizable units feature coordinated daily lesson plans with two sections per lesson. The first "Learning the Basics" section focuses on language arts and math, including handwriting, phonics, reading comprehension, narration, counting to 100, skip counting, measurement, basic addition & subtraction, and more. The second "Learning through History" section emphasizes God's plan from creation to the present day and links with other subjects in a coordinated unit study. Each unit contains five days of flexible instruction and easy activities that require little or no preparation--perfect for the busy homeschooling mom! Lesson plans are arranged in categorized boxes; reading lists, scheduling suggestions, and helpful appendices are also included. Each daily lesson takes approximately 90 minutes. 416 pages, softcover. Ages 5-7. See Book List PDF for a list of recommended (NOT included) books. 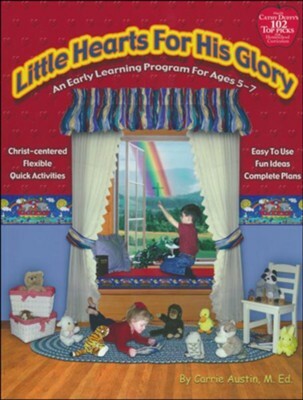 I'm the author/artist and I want to review Little Hearts for His Glory: An Early Learning Program for Ages 5-7.